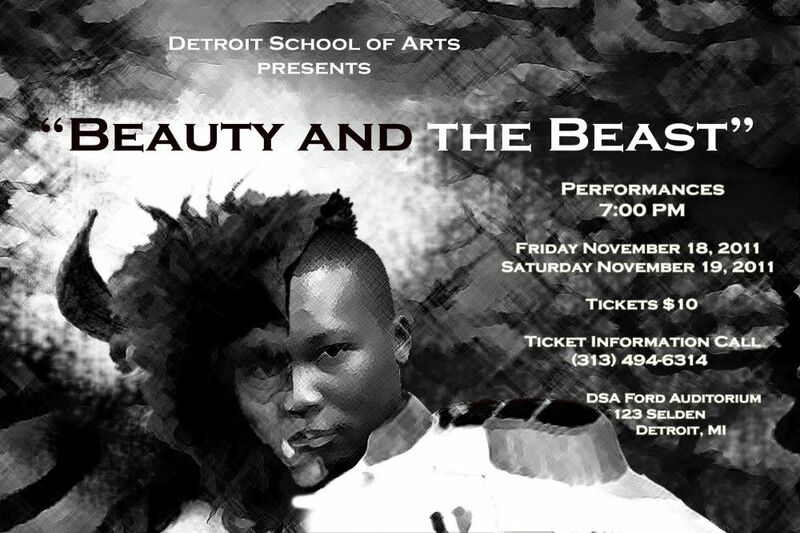 The award winning cast and crew of Detroit School of Arts Theatre Department cordially invites you to the fall production of Disney’s Beauty and the Beast! Four fantastic performances are scheduled for the month of November. Come to be enchanted by DSA actors, vocalists, artists and dancers, as they come together to perform one of Broadway’s most beguiling, modern day classic. Disney’s BEAUTY AND THE BEAST is based on the Academy-Award winning animated feature. The stage version includes all of the wonderful songs written by Alan Menken and the late Howard Ashman. Matinee Shows: November 17—18 2011, at 10:00 a.m.
Evening Performances: November 18—19, 7:00 p.m. Please call (313) 494-6314 to reserve your ticket today. This entry was posted in Events, Info News Center, News and Press Releases, Student Showcase and tagged 327.